Max. Height above ground: 111ft. Special track elements: Banked Curves, Vertical Loop, Steep Twist, Banked Helix, On-Ride Photo. Other info: To give the feeling of flight, the passengers ride in a lying-down position. 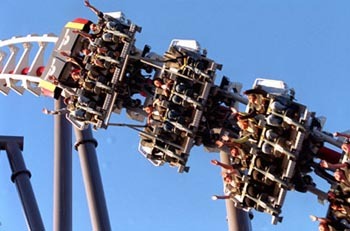 The track can twist to allow the riders to travel face-up with the track below them, or suspended face-down with the track above them. Maximum Ride Capacity: 80 guests, Vehicle Capacity: 4 passengers per car.